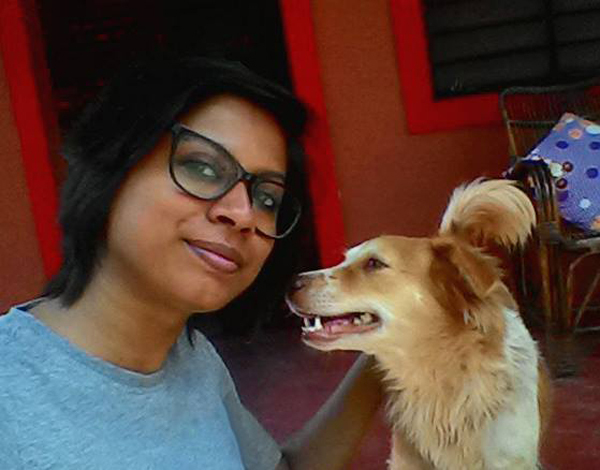 Hey I'm back to finish my Pondicherry solo-trip tales. Read other two here and here! 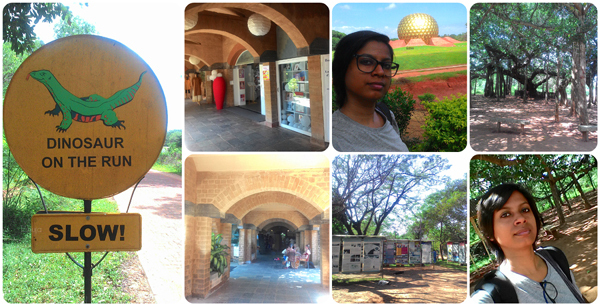 After my amazing time at Pondicherry, I headed to Auroville. 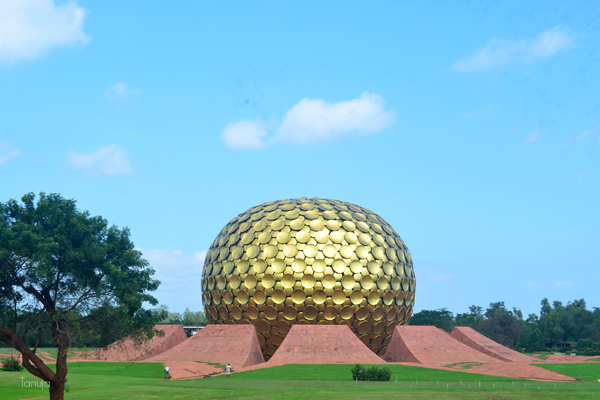 It's a spiritual township around 30 mins away from Pondicherry. 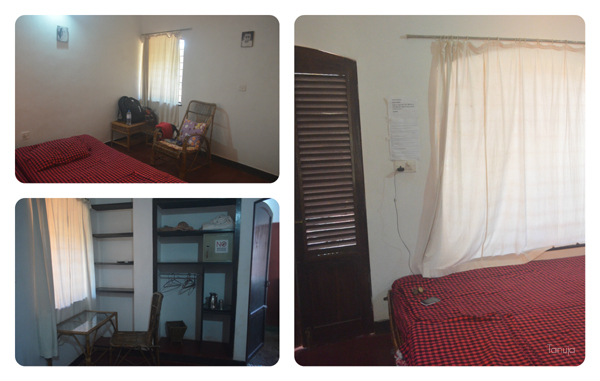 I had booked to stay at Atithi Griha looking at some beautiful pictures and it turned out to be really nice. The room I got was pretty neat. I was so dead tired after Scuba diving that I dozed off. After around 2 hours I woke up, got dressed, clicked lots of pictures, asked directions and went off the see Matri Mandir. I actually lost my way but reached at the place. The night view of the amazing architecture was beautiful. I was so close and it looked magnificent. I heard and saw lots of owls probably all Spotted owlets. An excellent place for nature watchers. I got back through a scary, almost lonely dark route. 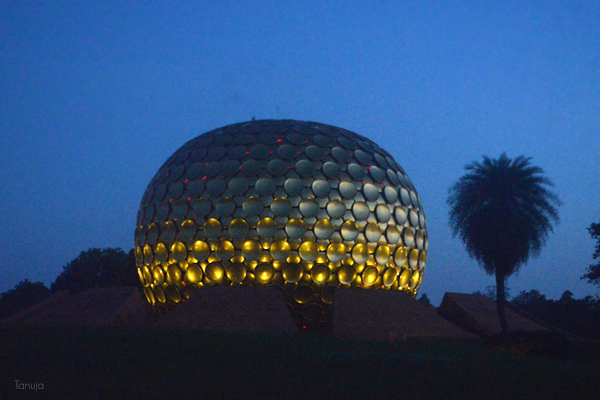 Do not roam alone at night in Auroville, at least on foot. There was no dinner at the place and eating places were quite far, so I gobbled up my snacks. Craving for some tea I asked at the counter. He said that he doesn't serve tea but would make a cup of lemon tea for me while he makes some for himself. I happily agreed. So we had a good chat over the tea. He said that he's a Nepali, doing odd jobs here. He's been here for last 10 years. Random topics came in like the Nepal earthquake, different places in India, foreign people staying there, how he gives vehicles on rent, how he waits for the bullet trains to be launched in India so that he can go home in a faster way. I shared my journey till now and he was amazed :) After a while I was off to my room and fell asleep. Quite an exciting day it has been. I woke up right before the breakfast time. 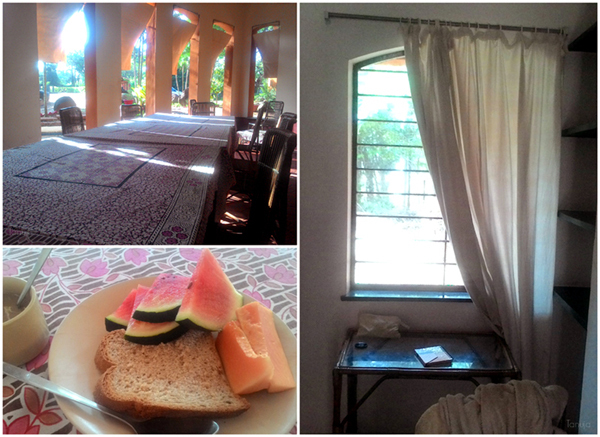 There was brown bread, papaya, watermelon served along with various beverages, jam and butter. There was a North Indian family who joined there and much later a foreigner couple. After sometime a Cheery Indian girl joined me up and asked if that's it for the breakfast or she missed anything. We had a good laugh over the boring breakfast served. We Indians are used to heavy spicy food even in the morning. We chatted up while eating. I shared my side of story and she did hers. 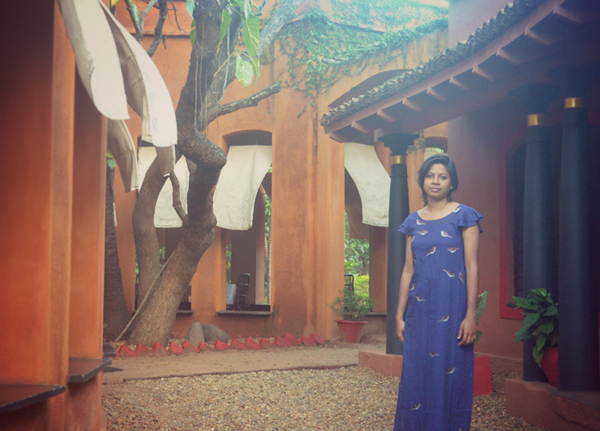 She was doing a solo art exhibition in Auroville and has done solo trips before. Isn't amazing meeting other Solo travelers especially women. 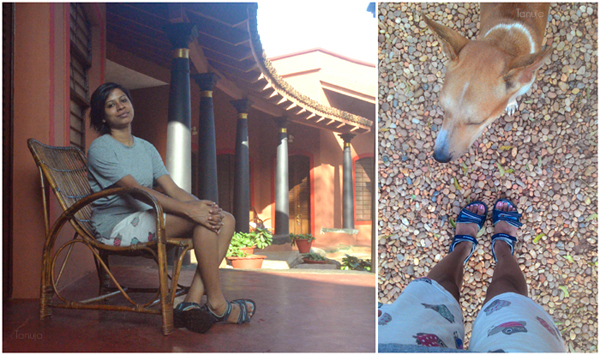 :) She was off and I has some time in hand before I left for my journey to Chennai. I simply strolled there, relaxed, looked around the place, played with the doggies & took lot of pictures. I checked out around 11 am and walked out to again see Matri Mandir in the day light. This time I took a public route and saw it from quite far. I was awestruck with the golden look of Matri Mandir. The place was flooded with tourists. I took a bus from there to the main entrance. At the entrance one can find lots of eateries and boutiques and shops. So buy your souvenirs from there like I did! Quite an expensive place I must say. I had a typical Thali in lunch with rice, dal, papad etc and went in search of an Auto. I got with a cheap deal. The auto person left me till the main road and there he helped me find a bus to Pondicherry Bus stand. That is what was left in my journey, a travel in the local public transport. I got a seat and enjoyed the Tamil songs. From there I took a bus to Chennai. It went through ECR road which had the beautiful Bay of Bengal by it's side. I reached Chennai in 3 hours. After that I took my train from the Indian Railways and reached my city Bhubaneswar the next evening. 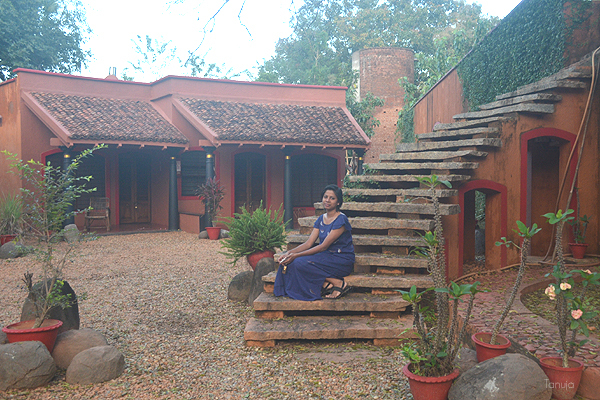 This was a really short stay in Auroville. I wished to stay longer to understand the concept behind the place and have a learning. Somethings remain pending to happen next time. An everlasting bunch memories for me. 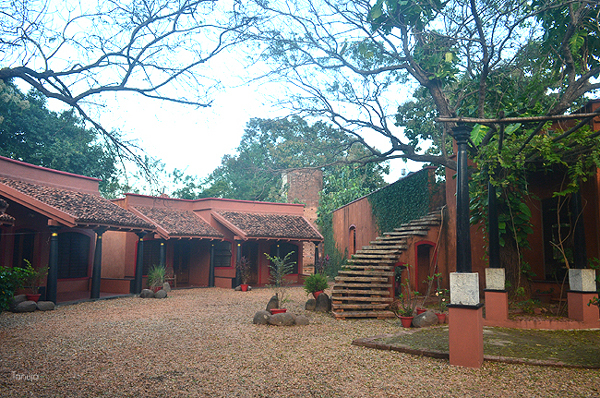 Atithi Griha which means the Guest's home in English. Me in my-made sparrow dress. 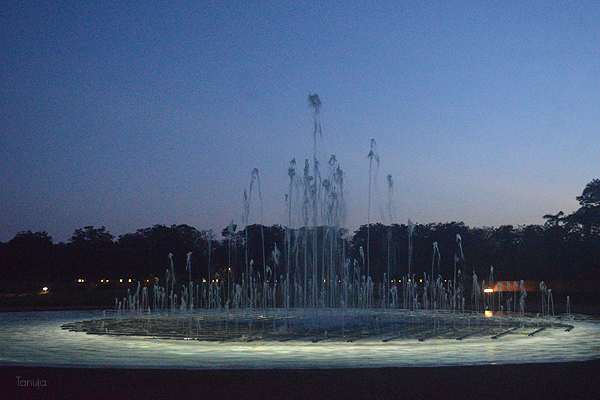 A fountain there! It was so peaceful. The room looked better now with Mani posing. You can book your place and volunteer for various programs through it. And love your sparrow dress. 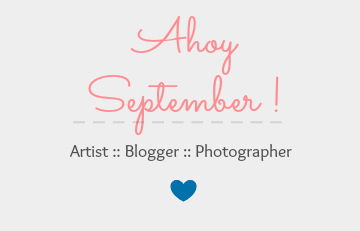 Keep doing your great work!! I love this. Amazing images too! whoa!! what a lovely post. I really love this. You look very pretty in simple. I like to wear net salwar suits for this summer. Thanks for sharing with us. 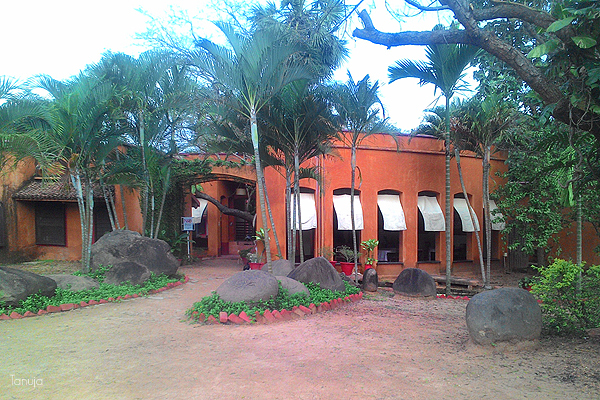 Seems like you had a great time at Auroville, I do love Auroville for its peace and calm. I love this. Amazing images" too!